In celebration of Bike Month, UrbanCincy has partnered with the City of Cincinnati to bring you two unique events. The first will take place on Saturday, May 14 and take bicyclists on a pedal-powered pub crawl through the city’s urban core. The second event will take place on Sunday, May 22 and give riders a glimpse into what bicycle commuting will be like along the Ohio River Trail. Bikes+Brews is back by popular demand. Last year UrbanCincy organized this event and made five stops throughout Downtown and Over-the-Rhine. 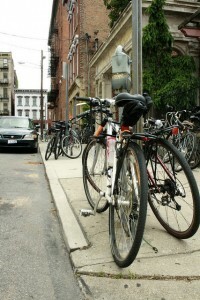 Roughly 50 people participated over various segments of the ride which began and terminated at Findlay Market. This year’s event will also begin and end at Findlay Market, but will include a total of nine stops throughout Over-the-Rhine, West End, Downtown, Newport and Covington. The ride will be led by Cincinnati brewer, and UrbanCincy contributor, Bryon Martin. Bikes+Brews will begin at 1pm and will roughly last until 6:30pm. The event is free and open to the public, and interested participants are encouraged to join the ride for any duration and segment. The ride is approximately seven miles from start to finish (map), includes slight elevation change and two bridge crossings. The Ohio River Trail Tour is new this year. The event will begin at Lunken Airport and take bicyclists for a ride along the partially completed Ohio River Trail. The ride will terminate in downtown Cincinnati at the Bike & Mobility Center currently under construction at the Cincinnati Riverfront Park. Those participating in the Ohio River Trail Tour will be able to get information about future phases of the Ohio River Trail, which will link Cincinnati’s eastern suburbs with downtown, and how to successfully commute by bicycle by utilizing lockers, showers, repair facilities and bicycle parking at the new Bike & Mobility Center. The Ohio River Trail Tour will begin at 10am in the parking lot across from Lunken Airport’s terminal building. The ride is approximately six miles (map) and contains very few changes in elevation. 2010 Bikes+Brews photograph by Jenny Kessler for UrbanCincy.